As in2thefray recently suggested, I think it’s time to try to use the WP Political Blogger Alliance more interactively. One idea would be a situation where I would occasionally post something that’s been in the news, send a pingback to the group, and gather opinions and input here. I think it would be interesting and informative, since I’ve gathered a pretty diverse list. Assuming that works, (and I’ll probably look at making that more condensed visually), then all I have to do is get an idea as to a) who checks their sites regularly, and b) who thinks this is a good idea and who doesn’t, so please respond and give your input on this one way or another. Also, there is no rule that says that I’m the one who has to initiate this. Any one of you are certainly welcome to use the list to call us out if you have something to post as well. It was kinda the idea all along with this; to form a bit of an informal network. So, what I might want to do is post a code that contains a condensed version of everyone’s urls so it can be posted at the end of a thread and not take up so much space, (in fact, urls with a series of periods or something would be almost invisible, save perhaps the button icon or something as an identifier), but first thing’s first. I just got a response from Psycheout that this might not have worked like I had hoped. I suppose I should have known better, as WP will alert us to pingbacks to specific posts on the main dashboard page (almost instantly), but not when it’s simply the blog url. Darn. That might call for plan B: ping targets. In other words, instead of the urls above, I would have to use the url to a specific post (or page) for each member of the alliance for it to show up in your dashboards. So…. Second-best option: I just find some old post to use. This would be less-than desirable, obviously, because I would be a pinging a post/page that is completely off-topic, but it would still work in terms of showing up as a “pingback” in the dashboard. Initially, this is what I might have to do just alert you to this thread, but from then on we could use the first method once everyone has their pages ready. Or, I could use something even smaller and more cryptic, like a bunch of periods (…..) and add them as we go, but I’d like to think that it’s better to advertise a little. I’d welcome input on this. Either way, I could use this thread to update the code as we add more participants. In fact, it might be a good idea to bookmark this page, so all you have to do is copy the current code and paste it at the bottom of your post (in “visual” mode; probably easiest). Boom! Everyone gets alerted by a pingback to their ping page and it will show up in your dashboard (as well as your “recent comments” in your sidebar, I imagine). The added bonus here is that curious visitors might be compelled to click on some of those links, which would result in gaining attention to the alliance and possibly more recruits that we might not have found otherwise. But remember, our club is exclusively for wordpress.com users! Update: We have 11 ping pages so far. Not too shabby for 24hrs. I think we can get all the letters in the code filled (again, we can always add more). Another thing I might do tomorrow is post a sample thread using the code we have, just to give everyone a better idea of what I have in mind. Has anyone ever told you that actions speak louder than words? Has it occured to you how your actions might look to others here at LGF? But most importantly, do you even care? Honestly- you’ve made it impossible for me in the future to ask people here to give you an argument instead of snarky comments. The stalker blog? Even I have limits. Nevermind the fact that the comment itself wasn’t directed at LGF or any of it’s members, or the fact that it was a comment that I would have made on LGF or anywhere else, or the fact that it was just one post out of thousands of comments I’ve left on probably hundreds of blogs (left, right, and center). You see, the simple act of posting a brief opinion in the comments section of the “stalker blog” alone has been considered to be “beyond the pale“. Dear lizards- For the record, I make no apologies. I view the blogosphere as one big forum. If I have something to say, I really don’t think I need to worry that much about where I’m saying it. I use the same nic everywhere, so I feel I should be judged not on the color of the blog but on the content of the comments that I’m posting. By the way, someone is going to have to explain to me what it is they do over at LGF Watch that qualifies as stalking. To me, a stalker is someone who physically follows you home and peeks through your window. After all, there’s a website out there called “Olbermann Watch“. Is that blogger stalking Keith Olbermann? Also, if their definition of stalking describes nothing more than an obsessive scrutiny of a specific blog’s posts and comments, and mocking a blogger and his/her commentors on a regular basis and over an extended period…they might want to take a look in the mirror. I am contacting fellow political bloggers. I hope this email is not an intrusion. Anyway, I would like it very much if you would go to http://www.bloggerschoiceawards.com/blogs/show/21020 and vote for me for best political blog and best overall blog as well, if you feel my blog is of a high quality. I really think I have a legitimate shot at winning. If you are open to spreading the word, that would be cool as well. I would consider it a privilege if you would add my blog “The Tygrrrr Express” http://www.blacktygrrrr.wordpress.com if you feel the quality is high. Notice that I have not linked to the blacktygrrrr site. You can copy/paste the url if you really want to check it out, but I didn’t really want to give the pimp the satisfaction of a link from my blog. I will, however, link to many examples of the pimping in question. A note to these bloggers: You got pimped! Those were just the ones I could find – FROM THE LAST 7 DAYS! Over the last few months I’ve stumbled upon blacktygrrrr’s cyber-graffiti countless times in the comments sections of blogs, and I don’t think I’ve come across an instance where he hasn’t pimped his blog. Even more irritating is the fact that the guy appears to be a Bushbot model 101. So, those of you out there who have added blacktygrrrr to your blogroll, or have been seduced by the pimp and actually voted for his blog in the Blogger’s Choice Awards, I’m sorry. But consider this post as an AMBER ALERT to catch a runaway blog pimp. I will kindly ask readers to report any future sightings, and I will add them to this post. Well, there’s nothing wrong with cashing in on a great piece of work, and I’ve stated before that Sisyphus should get “Post of the Year” honors for it ( Heliocentrism is an Atheist Doctrine ) , so….why not? I’m not sure if a blog post has ever been marketed before, but there you have it. Schmoozing is the natural ability “to converse casually, especially in order to gain an advantage or make a social connection.” Good schmoozers effortlessly weave their way in and out of the blogosphere, leaving friendly trails and smiles, happily making new friends along the way. They don’t limit their visits to only the rich and successful, but spend some time to say hello to new blogs as well. Well, I certainly do post on a lot of blogs. Forest Opine– A very polite blogger who uses the nic mdvp, I’ve seen this Fred Thompson supporter’s nic show up on quite a few sites other than mine. As an active member of the WordPress Political Blogger Alliance, mdvp isn’t afraid to opine on politics whether the blog is left, right or center. Kinda like me! Partition Of Iraq – Going by the nic gasdocpol, this blogger has a site dedicated to the 3 state Iraq solution advocated by the likes of presidential candidates Biden and Brownback. Like me, he is definately NOT a fan of GW Bush and I have seen him engage in debates on a few sites. Psycheout – This blogger is a contributor to one of my favorite sites, Blogs 4 Brownback. I’ve seen Psycheout’s comments on many political blogs, liberal and conservative. Insightful and clever. It appears these so-called supporters – who also run the site Blogs 4 Brownback (blogs4brownback.wordpress.com) – are really using the sites to parody the senator’s conservative political and religious beliefs, and perhaps make it appear that he is aligned with people who hold some, well, extraordinary notions. The sites look official and have blogrolls linking to a number of bona fide conservative websites, including Brownback’s presidential campaign. Postings from bloggers with names such as Mrs. T.D. Gaines-Crockett and Sisyphus provide just enough accuracy, and religious scripture, to appear oddly legitimate – even to other conservatives who comment on the musings. I’m not a spoof. That’s the standard leftist talking point- anyone who disagrees with them must be doing so in bad faith. The liberal religion brooks no heresy. Either one is with them, or one is only pretending to oppose them. As I stated when I featured B4B here in the Chamber a little while ago, I can understand how some people might dismiss the site as a parody at first glance, but after a week or two reading the site and the comments I think it becomes quite clear that it NOT a spoof. I believe the saying is “you just can’t make this stuff up”. But, hey, you be the judge. Take a look for yourself and tell me what you think. BTW- The B4B post mentioned in the DenPo article, “Heliocentrism is an Atheist Doctrine“, gets my vote for “Post of the Year” (if there is such an award). If you have the time, go ahead and read the 1200+ comments (incidentally, the bloggers over at Scientific American weren’t sure if it was a spoof or not either). Also, I guess it should also be noted that B4B already has a ‘watch’ site, Blogs 4 Moonbats. Ain’t blogging fun? *As any regular reader of my blog can tell you, I am not a Brownback supporter. I do, however, consider myself to be open-minded, and although I don’t agree with virtually everything that Sisyphus (and friends) posts on the site, for whatever reason I find it entertaining. 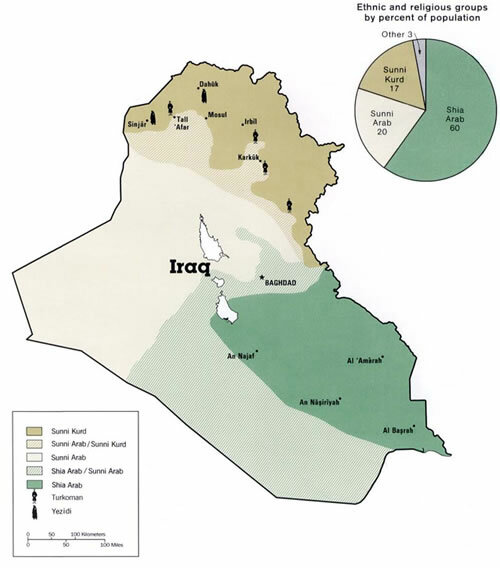 Under the plan, Iraqis would divide the country into three main regions. Each would assume primary responsibility for its own security and governance, as Iraqi Kurds already have in Kurdistan. Brownback has been talking about this for months, and if I remember correctly, he was the only GOP presidential candidate in the field that brought this up in the debates thus far (although I could be wrong about that). Biden has been pushing for his “third way” for quite a while as well. What I haven’t seen, I suppose, is a lot of serious talk about it in the media. I know all this isn’t exactly news, but I thought I’d bring the debate over to my blog. My personal feeling on this is that it may be too late for this. Had this been the initial plan, this would have gone quite a bit smoother that it would to try to do it now. In fact, at this point, it is almost like starting over. Maybe that’s why the idea hasn’t picked up a lot of steam. Hypothetically, if someone were omnipotent and knew that this would be the only way to achieve a positive outcome in the region, it would be interesting to know if the American people would have the will to see this through. The biggest problem is getting the Iraqi people to go along with it, and it isn’t clear that there is a lot of support for this idea. Even if they were warm to it, it’s hard to imagine that they would have a lot of confidence in our ability to pull it off in light of all the missteps and incompetence that have plagued the effort up to this point. In the end, there may be just too many variables and risks in just dropping what we’re doing and try something completely new. *I’m not sure how old this map is, or even its exact origin. It’s quite possible that the war has changed the landscape quite a bit, so consider it a pretty basic visual representation.